Only yesterday we wrote a small guide on boxing punchbags. It was written to satisfy a slew of emails wee were getting - because the name of the blog is Punchbag Blog, some people found their way here expecting us to talk about punchbags. Fair enough I guess. The guide was only published yesterday, but we've already had alot of positive emails about it, so we're quite glad we did it. For that reason, we decided to write another guide, this time about what you hit the punchbag with - boxing gloves. 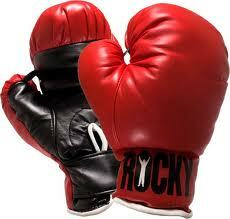 Choosing a pair of boxing gloves is important, because they need to feel right. Much like a footballer is very particular about what he puts on his feet, boxers are specific in what gloves they will wear. Some are more suitable than others, but below we have some suggestions which should be good for whatever stage you are at in your boxing. This might turn into something of a boxing equipment series if this post takes of as well as the punchbag one did, so if you like it, let us know. We've listed some of the features of the gloves, but if you have any other questions about the you can either follow the link through to Amazon or even send us an email - punchbagblog@gmail.com. Happy hunting. Great for a kid new to boxing. We've covered various types of boxing gloves there, including kids, women and rookies, so there is enough here to get you started. All of these are chosen for a mix of high-quality and comfort, but ultimately you're the only one who can decide how a pair of gloves work for you. If you're wanting to experiment you can start with a cheaper pair, but like most things, the more you pay the better the quality. We'd recommend going for the mid rang prices, because you'll start to find better quality there. If you go to a gym, you can always ask the trainers there what they would recommend, and also ask your gym mates what they are using. The gym is there to support you, so if you need to know anything about equipment, just ask them. As mentioned earlier, feel free to send an email our way as well.